One big difference between ministering to Muslims in the West and ministry to Muslims inside Muslim lands is that in the West there is still freedom of religion for Christians to share the gospel. But the Christian church in the West is only beginning to wake up to the calling it has to share Christ with Muslims. Usually Muslims are just dismissed and ignored as being too hard and too antagonistic to the gospel. Yet as the Apostle Paul said in Romans 10:14, "How, then, can they call on the one they have not believed in? And how can they believe in the one of whom they have not heard? And how can they hear without someone preaching to them?" Some churches hold courses and give books and training to their people to be able to minister to those in cults like the Jehovah's Witnesses, Mormons, and so on, but Islam, the fastest growing world religion, counting one fourth of the world's population, is rarely touched upon. We believe there is a critical need for the church in the West to understand how to minister to Muslims. And for this reason, we have put together this Seminar on Islam for churches and individual Christians who are interested. The seminar is available in both English and Italian. The seminar is interesting and informative, compiled using a number of different resources, including our own personal experiences from over 25 years living and working among Muslims. 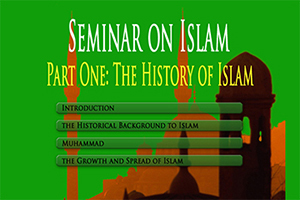 The seminar is in 3 parts, the first part relating the history of Islam, the second part explaining what Muslims believe, and the third part covering how to share Christ with Muslims. The whole seminar runs around three and a half hours. To watch each part, just click on each video below. Alternatively, the seminar can also be downloaded and burned onto DVDs. 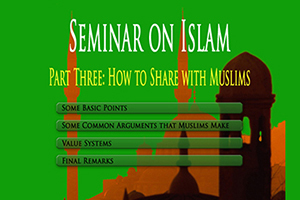 To get the instructions for downloading the seminar, please send a request by email to our email link on the website. 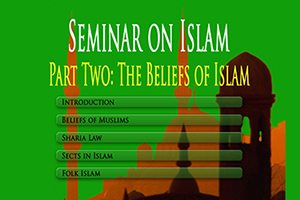 The full seminar can also be downloaded in its major sections from the website Engaging with Islam. The seminar can also be watched as compressed video on the same site. During certain parts of the seminar, you will see a note saying "Pause to Read". In those places, there are text passages which appear for a short time (such as Quranic or Hadith verses, or other information), which you will need to click on pause in order to read. It is recommended you do so in order to have a better understanding of how Muslims think. NOTE: THE SEMINAR VIDEOS ARE NOW BEING HOSTED ON VIMEO. WHEN YOU CLICK ON THE SEMINAR ICON BELOW YOU WILL BE REDIRECTED TO THE VIMEO WEBSITE TO VIEW THE VIDEO. Free PDF downloads of the Jesus & Muhammad book in Arabic, Spanish, Italian, & Portuguese. To view PDF files, you need to have Adobe Reader installed on your computer. To get the free Adobe Reader, click the icon.